ASTANA – President of Kazakhstan Nursultan Nazarbayev dismissed Karim Massimov from the prime minister’s position, appointing former Deputy Prime Minister and Minister of Economy Bakhytzhan Sagintayev in his place, amid several other new high-level appointments Sept. 8 and 9, the Akorda Press Service reported. He held a meeting of the new government Sept. 9, following which a number of budget changes were announced. Massimov was appointed Chairman of the National Security Committee of Kazakhstan, replacing Vladimir Zhumakanov, who was later appointed assistant to the president and secretary of the Security Council under the President. 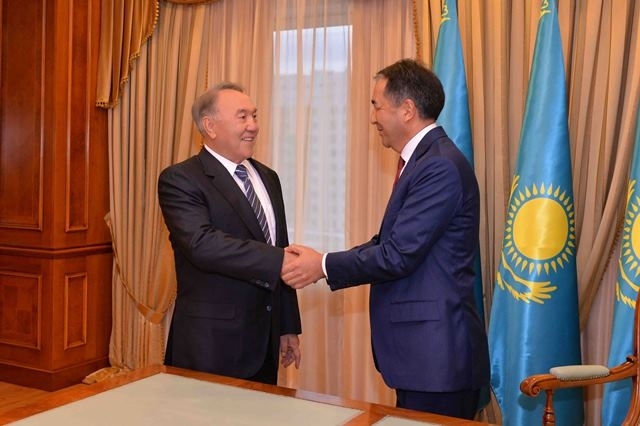 Askar Mamin, former head of Kazakhstan Temir Zholy, the major national railway company, was appointed First Deputy Prime Minister. Sagintayev has served as minister of economic development and trade, first deputy chairman of the Nur Otan Democratic Party and minister of regional development. Previously, Massimov headed the Cabinet of Ministers, and from 2012 to 2014 served as head of the Presidential Administration. On April 2, 2014, he was appointed prime minister for a second time. The senate consented to the appointment of Massimov as chairman of the KNB during a meeting of the Senate on Sept. 8. During the Sept. 9 extended format meeting with government authorities at the Akorda Presidential Palace, Nazarbayev outlined a number of specific tasks for the coming period. He stressed the government’s main task of improving the population’s standard of living and cited massive entrepreneurship as a priority. He called for the further development of relevant programmes and improved support tools. “I instruct the government jointly with akims [governors] to take measures for the organisation of cooperatives in rural areas, which should ensure the marketing and processing of agricultural products,” he said. Nazarbayev also noted the need for further work on a project to provide free professional education for all. By the end of the year, the state budget is expected to be replenished with 830 billion tenge (US$2.5 billion). This will help the government shift from crisis management to implementing strategic development objectives, he said. The President suggested using the last quarter of the year to prepare a new agribusiness development programme based on the Agribusiness 2020 programme. The agricultural subsidies system needs to be improved, he said, and instructed the government to allocate an additional 97 billion tenge (US$287.1 million) this year to support agribusiness, specifically targeting veterinary safety. In the interest of diversifying the economy, the government and regional governors should focus on export stimulation and development, Nazarbayev said. “We started the second five-year industrial programme. It is crucial to improve the quality of selected projects. I emphasise that a new five-year plan should be oriented on non-primary export products. The main criteria for selecting projects should be export capacity, high performance and innovation. I instruct the government to allocate the necessary additional funding to support the programme in the amount of 112 billion tenge (US$331.5 million),” he said. He also stressed the importance of implementing agreements with China regarding the Silk Road Economic Belt. Many of these coincide with the Nurly Zhol economic stimulus programme, which focuses on infrastructure development. He requested an additional 74 billion tenge (US$219 million) this year to accelerate ongoing infrastructure projects. With the currency market stabilising, Nazarbayev instructed the National Bank and the government to take measures to restore long-term lending activity. He also noted that the World Bank, the European Bank for Reconstruction and Development (EBRD), the Asian Development Bank (ADB) and the Islamic Development Bank (IDB) are planning to allocate up to $7 billion to Kazakhstan in the next five years through a cooperation programme approved in 2014. “The government and akims need to consider the possibility of expanding this programme and attracting additional funds to the economy,” he said. Saying the country had had some success in developing much-needed housing, the President also called for continued work. Last year, a record 9 million square metres of housing was opened, he said, and by the end of 2016, another 10 million square metres are expected to be ready. “At the same time, the population’s need for housing remains high. The solution to the problem requires new integrated approaches,” he said. He instructed the government to develop Nurly Zher, a unified housing construction programme integrating all existing housing programmes. Continued construction of credit housing through a housing savings system should be a component of the programme, he said. Following the meeting, Nazarbayev called for a revised central government budget for the current year that allocates an additional 380 billion tenge (US$1.1 billion) to implement priority projects and activities. He called for National Fund savings to be held. “In 2016, I instruct reducing the amount of the guaranteed transfer on 400 billion tenge [US$1.2 billion] and the targeted transfer on 50 billion tenge [US$148 million]. The government needs to revise the costs of executing my orders for the coming three-year period in the draft budget for 2017–2018, which will be submitted to Parliament,” he said. On Sept. 13, the Kazakh President signed several decrees reappointing the overwhelming majority of ministers. Changes concerned the former Minister of Defence Imangali Tasmagambetov who was appointed Deputy Prime Minister; the former Minister of Justice Berik Imashev who was appointed chair of the Central Election Commission, while Chief of the General Staff Col. Gen. Saken Zhasuzakov was appointed Minister of Defence. Former deputy chief of staff to the President Marat Beketayev was appointed Minister of Justice. Kairat Kozhamzharov, until recently head of the Anti-Corruption Bureau, was appointed Chairman of the newly established Agency on Civil Service and Fighting against Corruption. Dariga Nazarbayeva, the former Deputy Prime Minister, was appointed a member of the Senate of Kazakhstan under the presidential quota.